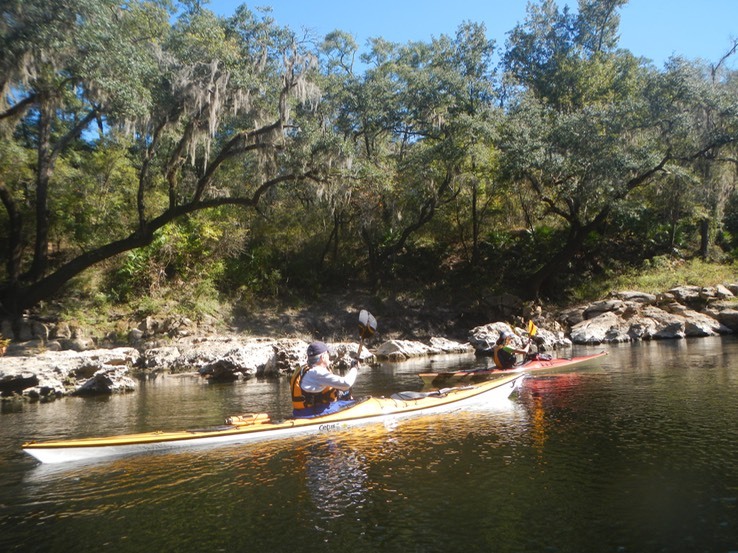 This was my third trip on the Suwannee River, my second with Paddle Florida, plus a few day trips there as well. I probably wouldn’t have signed on to this trip again if it weren’t for my friend Alan Lovgren, an old paddling buddy and a new resident of Florida. Alan asked me to join him on this trip. It had been a long, hot and humid summer in Florida. I hadn’t been out paddling very much in the summer heat. Alan’s invitation gave me the push I needed to get back in my boat and do some paddling and camping. This trip covered the same ground as my last trip here ( see Sixty-five Miles on the Suwannee River). We met at the Shriner’s club in Branford to load our boats on trailers for the shuttle to Madison Blue Springs State Park on the Withlacoochee River. I thought the Withlacoochee flowed west into the Gulf of Mexico. In fact, I was sure of it, having paddled it the year before. Yet this Withlacoochee flowed southeast into the Suwannee. Two Withlacoochee Rivers? For the uninitiated like myself this was very confusing. I found that the Withlacoochee flowing into the Gulf is called the Withlacoochee (North), while the river flowing into the Suwannee is the Withlacoochee (South). 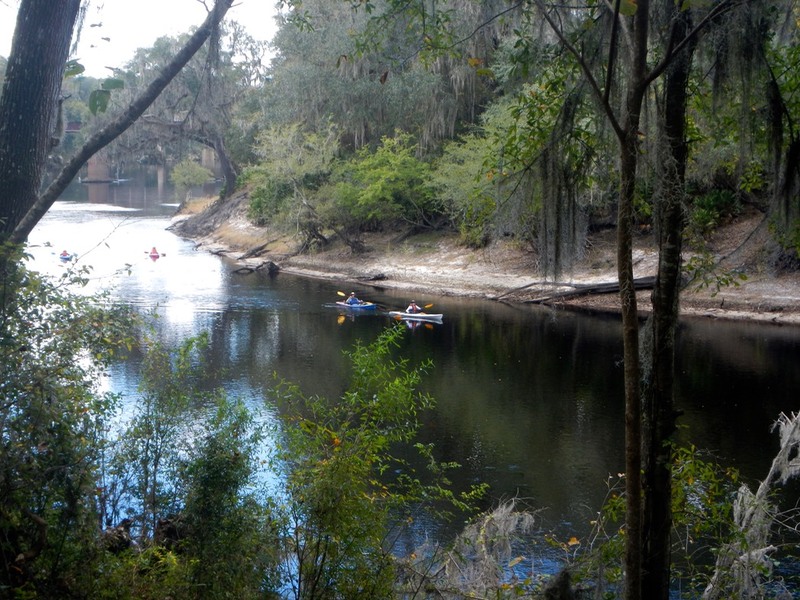 From Madison Blue Springs we paddled twelve miles down the Withlacoochee (South) to its junction with the Suwannee at Suwannee River State Park, where we would spend the night. We passed a number of springs along the way and paddled through a half dozen shoals (See videos below). Suwannee River State Park is one of my favorites. It sits high on a bluff with views up and down the river. But that night the bugs were out in force. Temperatures were in the high seventies and not a breath of air could be felt. I retreated into my tent, bringing a few biting bugs with me. It would be a long, warm night. Our next stop was the Advent Christian Village, a home for retired ministers. The Village has extensive grounds, perfect for camping, and offered us a chance to sit inside on chairs at tables for our meals, a real treat! 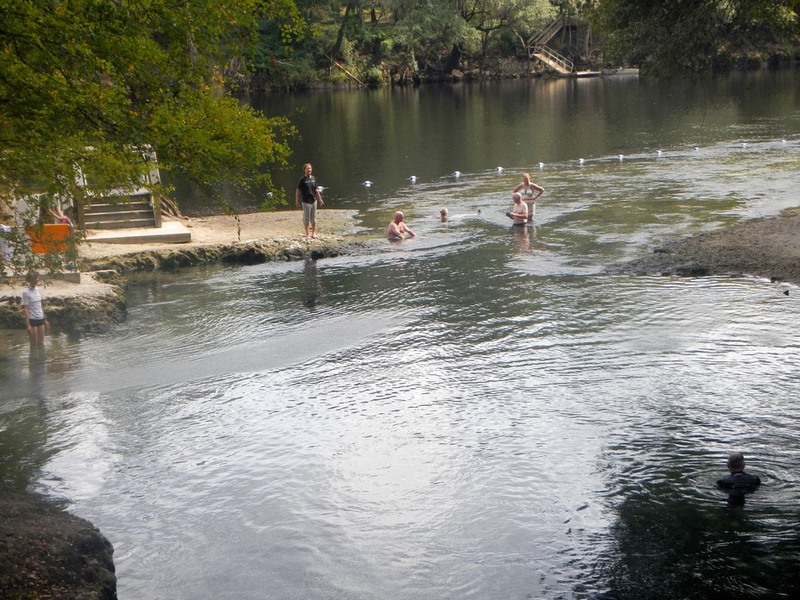 On our fourth day it was on to Lafayette Blue Springs State Park, about ten miles further down the Suwannee. It was an easy and pleasant paddle, taking only about three hours, including stops. We spotted two springs along the way. One was unnamed. The other was Charles Spring, a large, well developed spring where we stopped for a short break. Lafayette Blue Spring is lovely and even enticed me into the water for a swim, or more precisely, a dunk. After dinner that night we had a great performance by the Big Cypress Blue Grass Band. A red sky the next morning warned of approaching weather. We would paddle over eighteen miles on this day and be on the water almost five hours with stops. We were on the water before nine o’clock under mixed clouds and sun. Our scheduled lunch stop came at 7.6 miles at the Peacock Slough River Camp. I have been to Peacock Slough a bunch of times. It is one of my favorites. 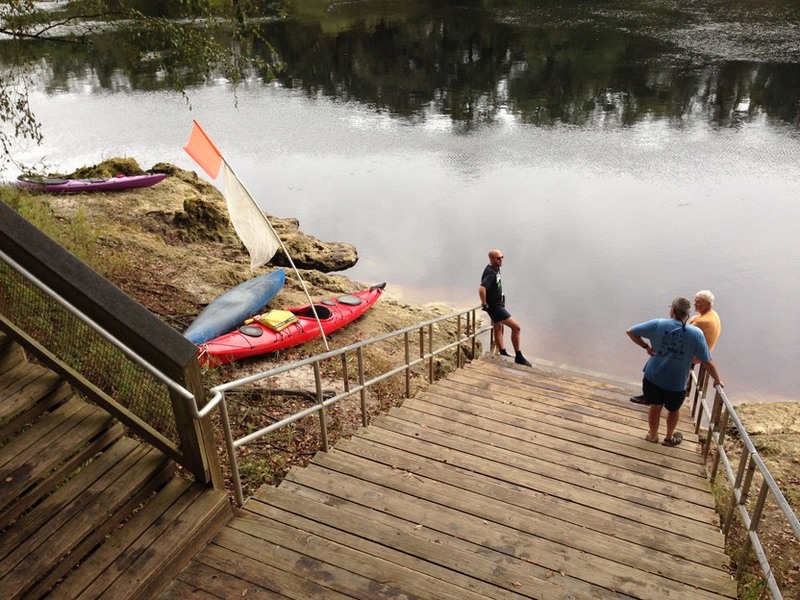 It sits high above the river, protected from high water and has one of the best landings of any river camp on the Suwannee River Wilderness Trail (click here to view/download the Suwannee River Wilderness Trail Paddling Guide). After our break at Peacock Slough we stopped long enough to view more springs without getting out of our boats. Before long the clouds thickened and the wind picked up. Soon we had a stiff wind blowing directly in our faces. Finally, we made it to Adams Tract River Camp, a nice camp with the worst landing among all of the river camps. With average water levels, there is no land to beach a kayak on. The steps descend directly into the river where you are expected to get out. This day, with the river a little low, there was some marginal shore exposed, some distance down the shore. We were among the first to arrive, so we grabbed what space there was available. After unloading our gear, we secured our boats to some nearby trees before leaving them for the night. Late arrivals had to carry their boats up the steps to racks on high ground. This video of the Suwannee/Withlacoochee Springs was posted on an earlier trip report. The last day of this trip took us from Adams Tract River Camp to the village of Branford. It was an easy nine mile paddle to our takeout at Ivey Memorial Park. After loading our boats and gear we were treated to a delicious picnic lunch at the Shrine Club. Then it was head out for the several hour drive home. 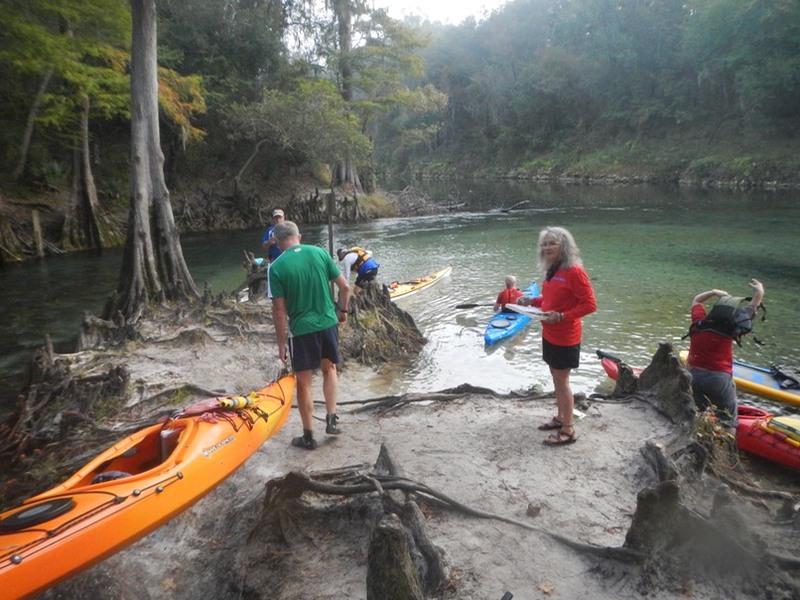 The Suwannee River Wilderness Paddling Trail is a relatively easy paddle that can be done in a variety of sea kayaks and canoes. Average paddling and camping skills are needed. The section we did from Madison Blue Springs State Park, down the Withlacoochee to its Junction with the Suwannee and then down the Suwannee to Branford is not difficult. Camping at the state parks and river camps is easily accessible, but this is not generally true at the Advent Christian Camp (you can ask for permission to camp there). However, If you want to simplify your trip, be entertained and meet some great people you should consider making the trip with Paddle Florida. 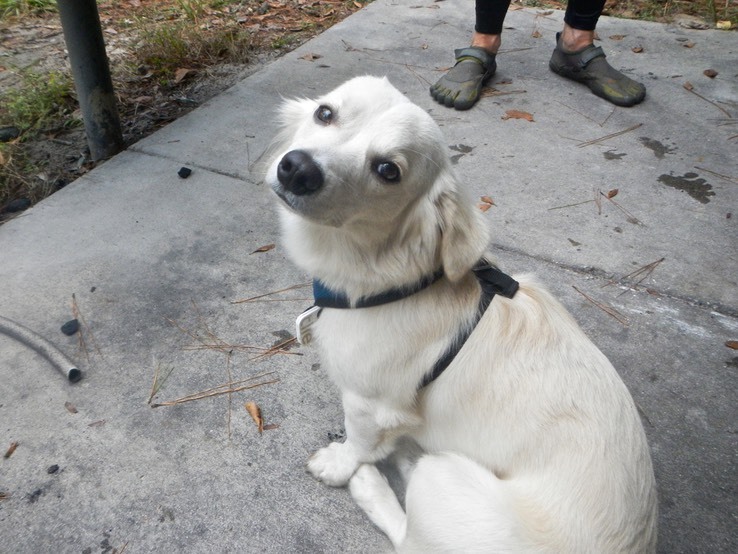 Bill Richards, Paddle Florida CEO, brought his rescue pup, Jessie with him on this trip. Generally dogs aren’t allowed on these trips. I’m glad an exception was made in Jessie’s case. Jessie was the sweetest pup I’ve run into in a long time, sweet and gentle, not pushy or annoying; my kind of dog. Just look at that face.